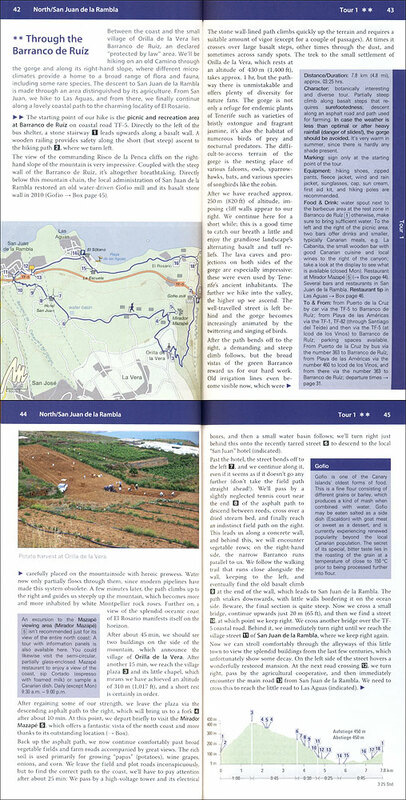 Tenerife Hiking Guide featuring 35 tours varying from easy to challenging, with detailed directions, distance and altitude diagram, trail maps and colour photographs. The author is a qualified sports instructor who safely guides hikers of all ages around the island. The guide opens introducing the area and provides information on the local geography, geology, flora, fauna and weather. Here you will also find general tips on when and where to go, equipment needed and safety. Then each tour is described with detailed directions rated according to level of difficulty from 1 to 4 stars, a diagram representing altitude, distance and duration, to help understand the type of route, and a sketched topographical trail map with additional symbols to locate places from viewpoints to bars and bus stops as well as to provide additional information about the terrain. All the maps in the guide are GIS-based and created in the UTM-coordinate system with the WGS 84 geodesic date. The scale of the sketches varies from 1:25,000 to 1:55,000, there is also a general map of the island at 1:360,000. Side text boxes offer a general overview on the walk, and useful tips from locating restaurants to how to reach the start of the trail by car or bus, the best time to start the trek and equipment. 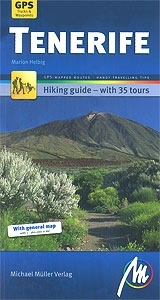 A pocket guide featuring colour photographs, this is an essential book for walking in Tenerife.